New guy on the block at Modality Systems, Tom Morgan has recently whipped up an awesome new app to fill in the gaps in functionality in Lync on the desktop. Lync picks up the US number ok, but.. When it comes to UK numbers, no dice. This kind of behaviour is actually acknowledged by Microsoft and the resolution is that “Phone-number detection in Internet Explorer is not enabled when the phone number is not a United States number and does not start with a “+”.” and that there is “currently no workaround for this issue”. Until now. Tom has written an accelerator for Internet Explorer that allow you to dial any number within IE easily and quickly. First we install the IE accelerator from Tom’s blog over here and click on Install Accelerator. After that, we’re ready to go, it’s that simple. 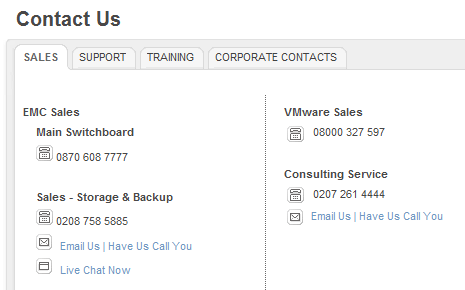 Now when we find a number on a webpage we want to dial, all we need to do is highlight it, right-click it and click Call using Lync. I’d only just installed the accelerator which is why I add to hover over All Accelerators, but you can move it to the left column by setting it as a default accelerator in the Manage Accelerators options in IE. 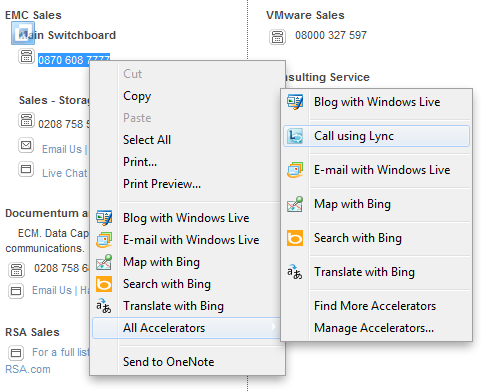 After we hit Call via Lync, Lync pops up with a conversation window, ready to dial the number. Notice that Lync has applied our company normalisation rules also? Pretty neat. Once I click the yellow highlighted part, the call dials and I’m good to go. But hey, it works right? Go and download it now from Tom’s blog and follow him on twitter as well. This entry was posted in Clients, Development, Voice Integration on February 6, 2012 by Justin Morris. The links here don’t seem to be valid and Tom’s blog doesn’t seem to mention this software.